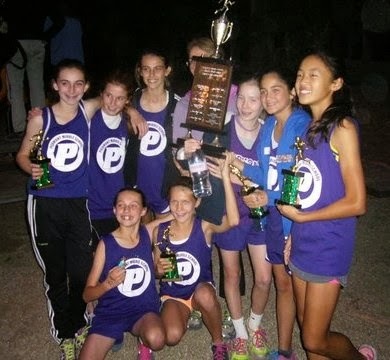 The Piedmont Middle School cross country team was in action this past week competing in season ending league championship meets. For the first time in team history, the team competed in the Southern Alameda County Middle School League championship held at Canyon Middle School in Castro Valley. Schools in this league are located primarily in the San Leandro, Hayward, Union City and Castro Valley areas. The 6th grade girls’ team rolled to a decisive win with a perfect score and won the team title in thiscategory. 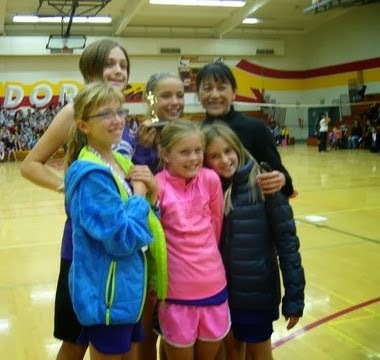 This was the second consecutive year for a PMS 6th grade girls team to win a league title. Piedmont girls took the first six places and had 8 girls in the top 10 finishers, and 12 girls in the top 16. Leading the way for the girls was Josie Gross-Whitaker in a time of 6:39 for the one mile distance while Maggie Black was a close runner-up in 2nd place in 6:40 and in 3rd place was Maria Delrosario-Chan in 6:45. On the 6th grade boys side, by a razor thin margin, the team lost by 1 point, taking second place. The first finisher was Josh Berg in 6th place and a time of 6:36, with Jayden Lee and Max Podell capturing 8th and 9th places respectively. In other races held at this meet, Zoe Torok won the JV girls race, and the Piedmont “B” varsity girls’ team place 3rd and the “B” varsity boys’ team was 5th with many of the team members earning a medal for finishing in the top 10 for their grade level. In addition, Piedmont entered its “A” 7 & 8th grade varsity boys and girls teams in the East Bay league championship meet held at Kennedy Grove Park in El Sobrante. Piedmont was the host school, putting on the meet for the other schools in the league. The Piedmont girls’ team has won this league title two consecutive years and was looking to “threepeat,” something only one other league school has accomplished. During the regular season, the Piedmont 7 & 8th grade girls had shown both quality and depth in convincing fashion and were the favorites going into the championship meet. This team was not to be denied and against some of the best school teams in the area, won easily by placing 5 girls in the the top eight finishers, and had 8 girls among the top 15 runners, a truly dominating performance by these ladies. The top runner for Piedmont, as she has been all season, was 7th grader Erin Hong in 3rd place in a time of 8:39 for the 1.25 mile distance. Piedmont runners captured 5th through 8th places in the standings to seal the team title as the first 5 finishers across the line and their place determines the team score, with low point total winning. Margo Donahue, 7th grade, in her first year of cross country came in 5th, followed by Clarissa Lam another 7th grader also in her first year of cross country in 6th place. Ellie Coleman, 8th grade, who also was a top ten finisher last year, was the seventh place runner and rounding out our scoring was Elie Cole in 8th place and she also is a 7th grader. For the boys in their championship race, they came close but didn’t quite have enough runners upfront in the pack to win, placing 3rd in a field of 15 teams. Leading the way as he has all season was Lorand Cheng, a 7th grader, who placed 8th in a time of 8:26. Just missing out on a top 10 finish, was 7th grader Aiden Dixon in 11th place and Toby Fischer an 8th grader in 12th place. Rounding out our top five runners was 7th grader Ethan Argue in 18th place and Walter Teitelbaum in 27th place.